Though there is no dearth of love stories being written today, with writers all trying to outdo each other in this genre, the truth is that some succeed, while the others get left behind in this race to the finish line. 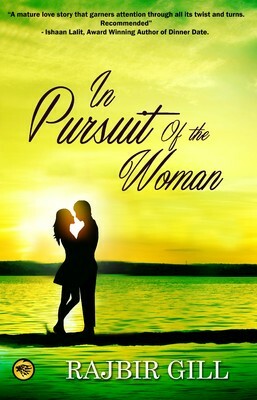 In Pursuit of the Woman, as is clear from its title, is a love story with a dash of mystery and intrigue thrown in as well. At the risk of revealing too much, what I really liked about this book was the unexpected and pleasantly refreshing climax. The two main characters of this story are Dev and Suman, who are supported by Ravi, a friend of Dev, as well as a whole lot of family and close friends, all playing their own roles in his pursuit of ‘the woman’. The main protagonist, Dev, is a befitting hero of this tale; a young and dashing naval aviator designed to be drooled over. Apart from his awesome job, it is the city he is now stationed at that adds to the charm of the story; Goa is a dream destination for many, and I, love the place. The honest and easy style of telling the story made it easy for me to imagine that city as I cherished so much, and follow the characters as they lived out this tale in this comfortingly familiar backdrop. However, despite the many positives associated with Dev, our charming young naval pilot, there are some darker aspects to his personality that stand revealed when we get to hear some of his thoughts plagued with archaic undertones. His internal dialogue, especially when contemplating the choice between his father and Suman, seemed a little outdated and unfitting in this current day and age, and his ideas about marriage, women and their supposedly proper/desired conduct did not sit in too well with me. And the thought that, in this day and age, even the supposedly modern people could have such outdated and old-fashioned beliefs is a little disappointing. As for the character of Suman, his love interest, even if only guilty of having to balance out the roles, appeared to me too submissive and orthodox in her own thinking. Hence, to conclude, though I loved the story, plot and the drama, as well as the unexpected twist at the end, I still had unshakeable issues with the dialogues (both internal and external) of many of the characters, throughout the tale. It is a crisp, enjoyable and well paced read and for a writer just entering the tricky field of romantic fiction, an admirable attempt. I wish the author best of luck for his future books and hope to read more of his stories. What I liked about the review is the balance and thought which went into it! Well done, Sulekha! My inclincation towards romance novels is fickle. Some days I love them, other days I can't read them at all. Good review, Sulekha! But I guess, I will give it a pass! You have somewhere convinced me to pick it up.. and yes I feel that many writers get left behind in this race.. no? A balanced & honest review….